Bath shower screens are a marvelous invention and definitely help to keep your beautiful floor clean and dry. The very first known indoor shower was patented in 1767 by an English stove maker. It involved a hand pump which got the water over the head into a vessel, the shower taker then pulled a chain to release the water. Until around the 1900’s “shower curtains” were used as a screen, and some use them to this very day. These curtains provided a certain degree of privacy and also kept water from running out onto the floor. It had basically the same functions as the evolved shower screens of today. The old fashioned shower screens, or bath shower curtains were usually made of a type of plastic, vinyl, or cloth. Often the cloth layer would be on the outside for aesthetic purposes, and another “waterproof” curtain would be on the inside. Strong glass (invented in France, 1901) was not used readily for shower doors until 1963. Of course it was nothing compared to the toughened glass of today. People of the past would put great thought into their bathroom decor, taking care to pick out their shower curtain ensemble with matching shower rings. Shower rings are what held up the shower curtain and gave it the capacity of sliding back and forth. The shower curtain ran on the same principle as hangers in a closet, which you could conveniently slide back and forth on a rod. Times have really changed and innovations have given us much advancements when it comes to bath shower screens. As time progressed the “shower” enclosure grew with it. The plastic bath curtains just weren’t doing the job of keeping the water in. What type of bath shower screens are offered on the market today? 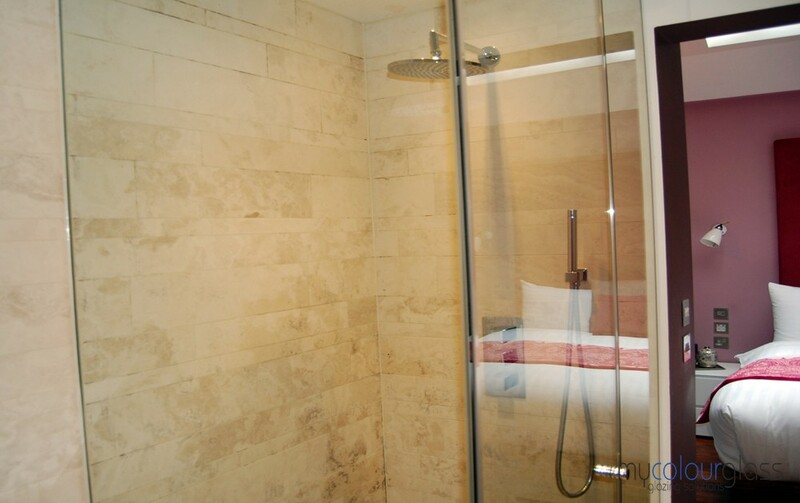 Framed Shower- A framed shower often uses a glass type or plastic derivative for it’s doors, or screens. Each one (panel of glass or plastic) is framed separately, such as in “sliding doors” you see opening out to old fashioned patios. Semi-Frameless Shower- A semi-frameless shower, does not have the metal frames around the door or screen. It does however have the frame around the shower enclosure still (like the old fashion showers, except it has a modern screen). Frameless Shower- Words cannot express the hot contemporary design capacity of the “frameless” shower. You will feel as if you are bathing on air, or in a cloud with the sleek new designs, which are also extremely functional. No more wrestling with the old fashion sliding doors encased on a metal runner. “Toughened” glass and modern engineering have achieved the most beautiful miracle when it comes to showers and shower screens. Nothing can beat a toughened glass shower screen when it comes to your decor, or functionality. These come in all of the colours of the rainbow and more. Feel free to shop around and see what we have at MyColourGlass. You will really enjoy seeing the latest in technology and designs. While you are visiting with us, you will definitely want to check out the ultra contemporary frameless bath shower screens along with the strong and long lasting features of each. This entry was posted in Glass & glazing Blog. Bookmark the permalink.